A stunning new concert hall hopes to lure visitors back to the island nation. On the ride into Reykjavik from Keflavik International Airport, it's hard to miss the shimmering glass building that sits on the water's edge. "What's that?" I ask the driver. "Harpa," he replies. 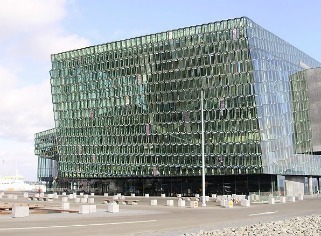 Harpa—the Reykjavik Concert Hall and Conference Center—is too new to be in guidebooks. But as Iceland's latest attraction, it's a sign that this country, which essentially went bankrupt during the global financial crisis, is crawling back onto its feet. To the Blue Lagoon, where tourists discover the joys of soaking in warm, mineral-laden seawater, and to the island's strange but beautiful terrain, Harpa adds a cultural dimension to Iceland's appeal. Now is a good time to visit Iceland. The steep devaluation of the króna has made costs more manageable, and airfares have come down. Hoteliers are willing to shave rates, and, as one merchant (who accepts dollars and euros) says, "We need hard currency." Harpa is already helping. The grand opening won't occur until Aug. 20, when acrobats and a wide selection of pop, jazz, and classical artists will perform alongside the Icelandic Symphony Orchestra. But when Harpa held an open house with classical concerts over three days in mid-May, 100,000 people showed up, an astonishing number for a country whose entire population is less than 320,000. Visitors are coming not only to see performances, but also to shop and to eat. Reservations at Kolabrautin ("Coal Train," a flashback to Reykjavik's past), an upscale eatery that touts its use of fresh Icelandic ingredients, are already a tough ticket. Many are coming simply to ogle the building. Designed by Henning Larsen Architects of Copenhagen and artist Olafur Eliasson, it's made of more than 10,000 glass windows that reference the columnar basalt common in Iceland's terrain. The south façade is a double wall of glass pieces that catches the sunlight and acts like a prism, creating colorful blocks of light on Harpa's floor and walls. The interior is intentionally spare, suggesting to visitors that they look out at the surrounding sea, mountains, and city—an especially pleasant activity from the multitiered bar descending along the south façade. On a Saturday in July, tourists were exploring the building by 9 a.m., an hour before the ground floor's casual restaurant, Munnharpan ("Mouth Harp") opens and two hours before guided tours of the 28,000-square-meter building start. The 45-minute circuit, which costs $15, takes visitors through Harpa's four concert halls, as well as event spaces and galleries. If the weather is nice, tourists may also want to linger in the vast outdoor plaza. Aside from presenting a broad mix of programming—Broadway shows, Björk, classical concerts conducted by Gustavo Dudamel—Harpa has a bigger role to play in Iceland's economy. The building was originally slated as a multiuse complex to house the new headquarters of Landsbankinn, a commercial bank taken over by the government during the crisis. 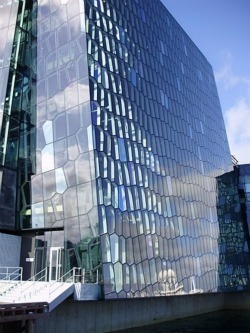 That dream died with the financial collapse, but the government agreed in 2009 to provide funds for Harpa. With its meeting rooms halfway between continental Europe and North America, Harpa hopes to attract business conferences and conventions to Iceland. No wonder that, when the sun is out, Harpa seems to glitter green.